Sashiko is a form of Japanese folk embroidery using a variation of a running stitch to create a patterned background. Traditionally made in geometric patterns with white cotton thread on indigo blue fabric, the designs include straight or curved lines of stitching arranged in a repeating pattern that is both aesthetically pleasing and functional. Sashiko embroidery has been used in Japan for centuries, dating back to the Edo era of the 1600s to the 1800s. The Japanese word sashiko means "little stabs" and refers to the small stitches used in this form of needlework. This style of embroidery and the "sashiko stitch" was used to reinforce or repair worn fabric or tears with patches, making the darned piece ultimately stronger and warmer. To get started with sashiko embroidery, you can try eight free traditional patterns. You can find full-size patterns for each design, as well as a diagram showing you how to work the sashiko stitch. A second set of eight patterns are also available. If you love the look of sashiko patterns, but want to try something a little different, you can experiment with changing up sashiko embroidery designs. Work with patterns in different ways, mix up the colors, or using non-sashiko stitches to open up a whole new world of embroidery options. Purl Soho, a needlecrafters paradise in New York City, offers an outstanding sashiko tutorial, which includes materials and stitching techniques using a pre-printed sashiko pattern. In addition to the basics, Purl Soho has a few fun projects that feature sashiko designs. 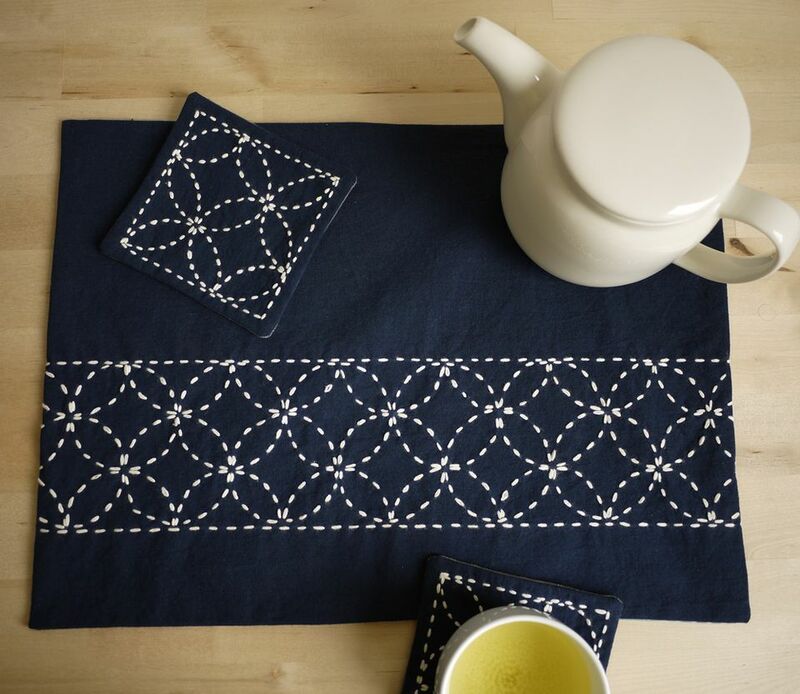 Their reversible sashiko placemats are especially delightful. 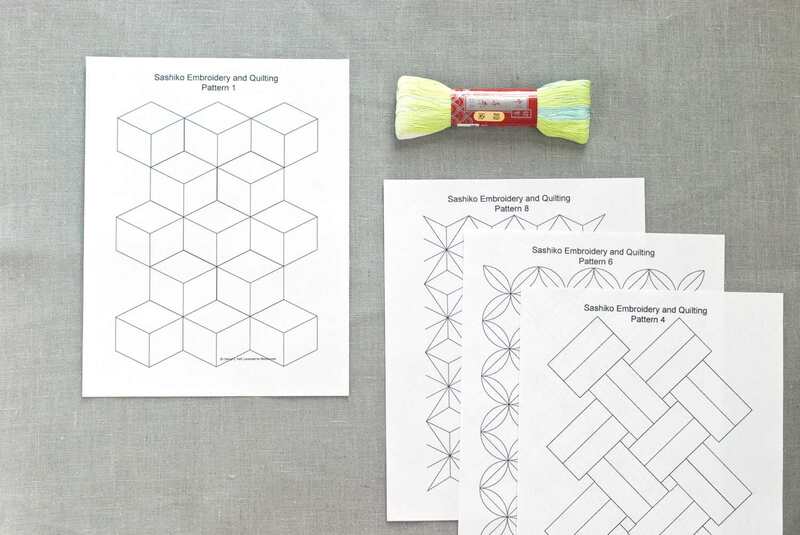 Sara Curtis of Radiant Home Studios collected 20 great links for creating beautiful items with sashiko. If you're wondering what to make with Japanese embroidery techniques, this is a perfect place to get started. For an easy project that is also useful, try making a kitchen towel with a band of your favorite sashiko design. All you need is a colorful ready-to-stitch towel and some sashiko thread or Perle cotton. An embroiderer inspired by her visit to Japan started Sake Puppets to sell her sashiko-inspired wares. Sake Puppets features a simple, but effective tutorial for sashiko. It includes helpful tips and diagrams for getting your stitching just right. The Sake Puppets blog has some wonderful ideas, sashiko samples, and a free pattern, plus you'll find PDF sashiko patterns in the artist's Etsy shop. For a small project, start with a single sashiko pattern and a frame. Then, sew your finished stitching onto a sachet pocket to freshen up ​your dresser drawers. It is fast to put together and can make a great gift. KimonoMomo is an Etsy store offering an extensive selection of sashiko supplies, patterns, and kits. Along with traditional colors and designs, the shop offers a few styles of sashiko patterns that you might not have seen before. The store offers everything you need in order to try your hand at sashiko and even a few ​YouTube videos with some helpful instructions.